Now that I've mostly finished my Christmas sewing, I was anxious to go on to some fun stuff. 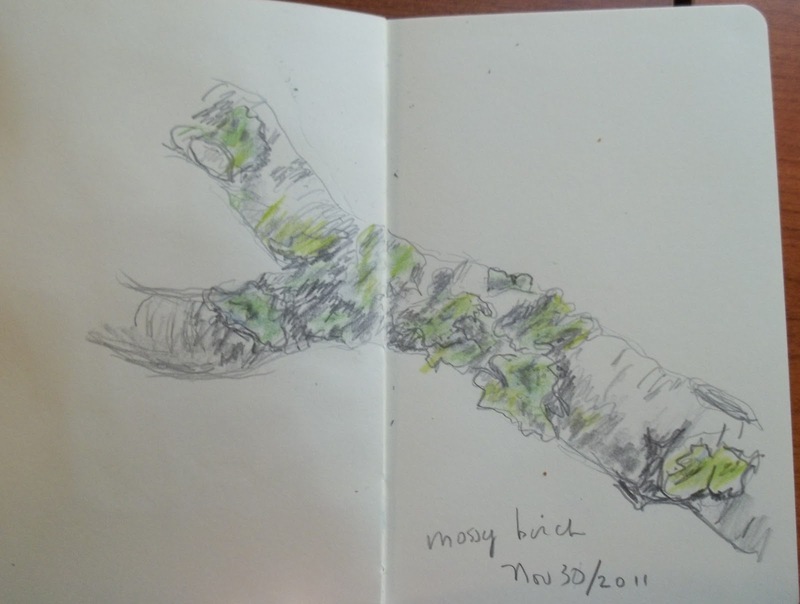 After my swim this morning and then my lunch, I sat down with my cup of tea and did this little sketch of a birch branch with moss on it. 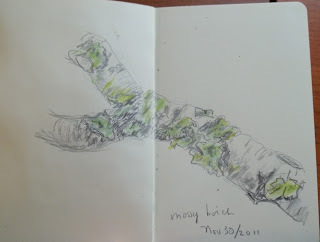 The moss covered branch has been sitting on the dining table for a few weeks. 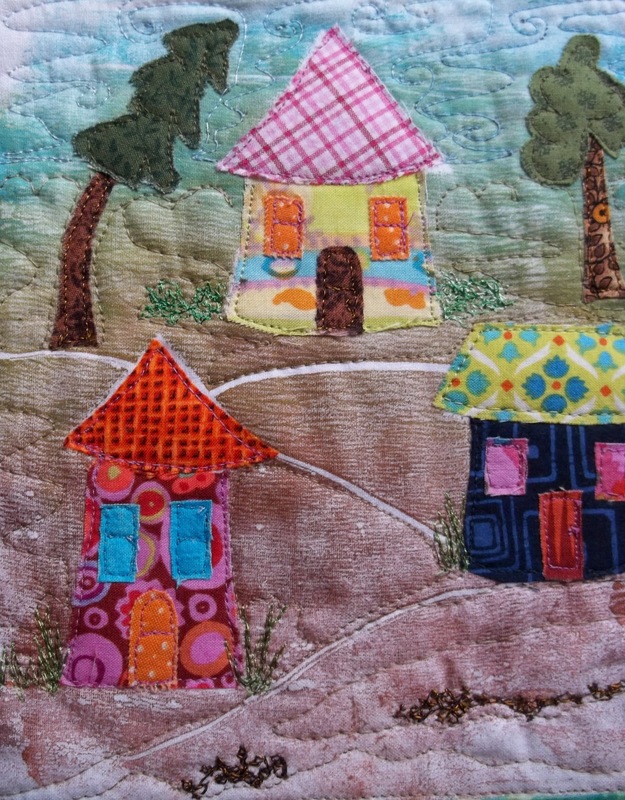 Isn't it wonderful how our husbands will put up with all manner of flotsam and jetsam and sewing bits all over the house? 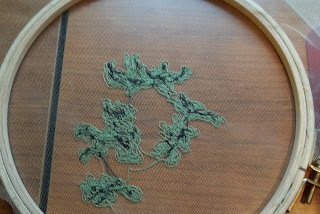 I stretched a piece of fine green tulle over a hoop, chose some thread, and went to work with some free motion stitching. 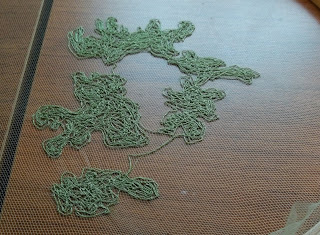 As you can see below, i simply outline my shape and then fill in with stitch. It's not exactly the color of green that I want, but when you live 2 1/2 hours form a fabric store, you make do. Once I layer on some other colors of thread, it will become more realistic. Here you can see that I've added black which is meant to be the darkest parts as well as the holes. Next, to make it more realistic I will add some different shades of green and grey. 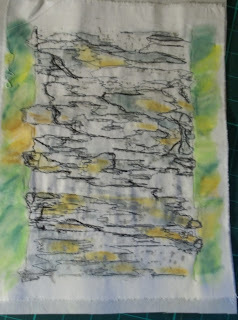 I then pulled out my birch tree rubbing that some of you may recognize from earlier in the fall. 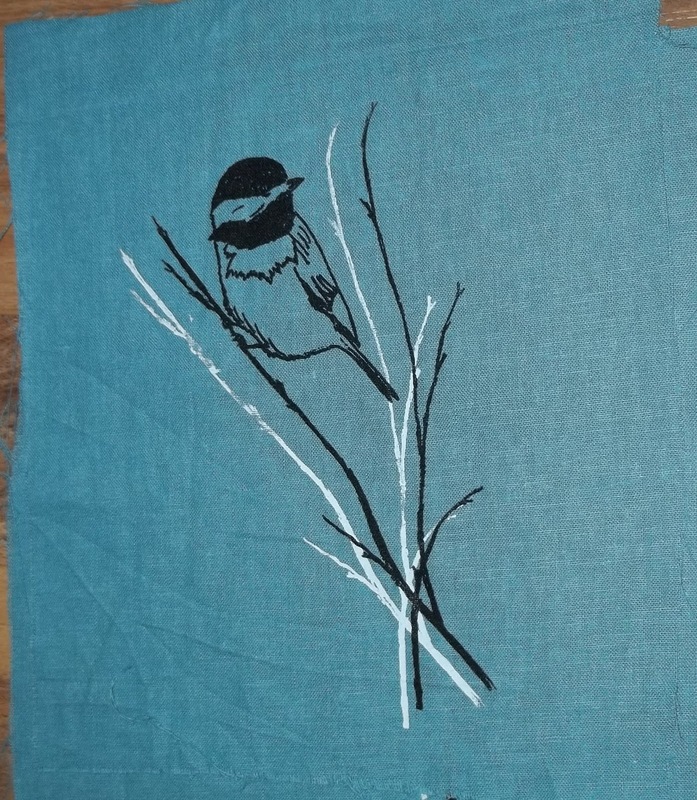 Since I had the black thread on my machine, I added another layer of stitching to the tree. As you may notice, I ran out of bobbin thread close to the bottom. I took that as a good time to stop and add a bit of color with my Neocolor II pastels. 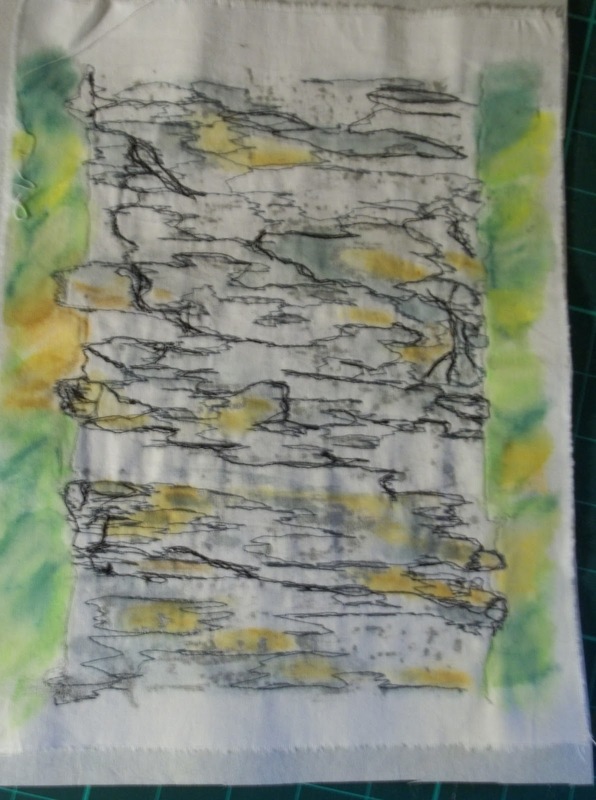 It's amazing to see how much color there is on a birch when you examine. 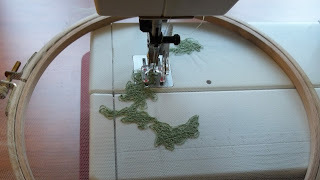 I am linking to the The Needle and Thread Network for WIP Wednesday. I did my bit of cursory housecleaning this morning and then went out for a couple of errands. I'm feeling quite fatigued this afternoon, so I'm shortly going to stretch out. 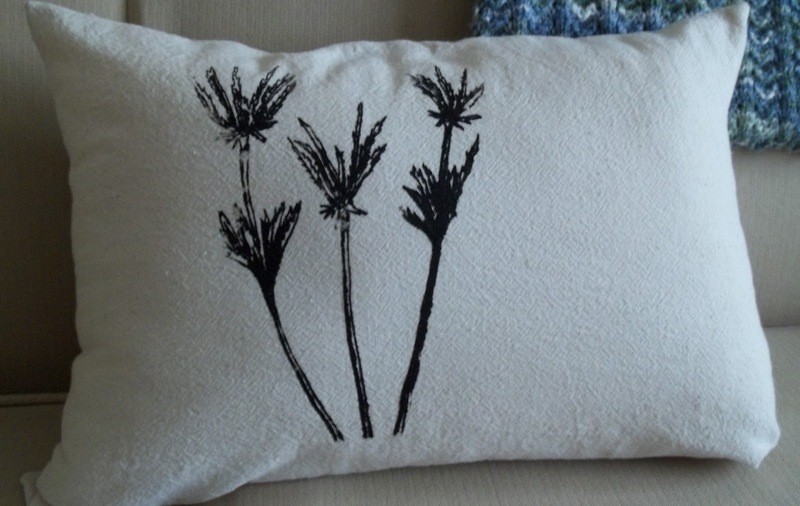 Here is the pillow that I stitched up yesterday from one of my prints. You may notice that I have it tucked under a bit on the bottom. I was a little too generous in my measuring and will have to take it in a bit. I thought it would be fun to make a few Christmas cards, so I just tried screening a few. The paint is still wet here. 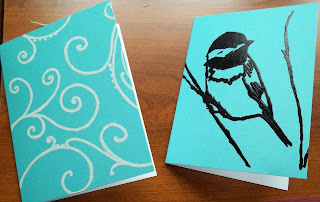 I may add some more details with a pen, perhaps snowflakes or some berries with the chickadee. It was a satisfying weekend. Yesterday, Gord and I did some errands and visited his parents for lunch. Then we came home and did some yard work, tying up trees and putting up Christmas lights. It was so nice to do when it was not freezing outside. 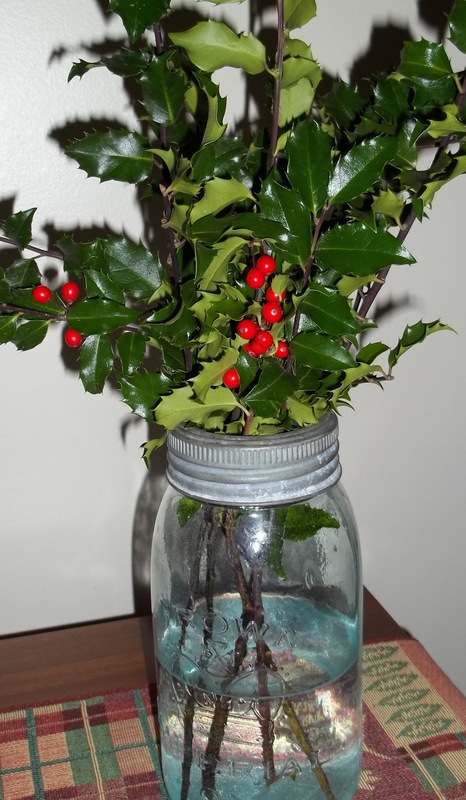 Before I wrapped my Holly bush in burlap, I cut a few branches with berries. I think I will use them in an arrangement for the front step. Today, we went out for breakfast, something we haven't done in a while. We shared a vegetarian omelet at the Nectar. After that I put Chef Michael Smith's sweet potatoe vegetarian chili in the crock pot. My nephew is taking a chef's course and has met him a couple of times. We ate the chili for supper and it was delicious. As I often do, I added a few extra veggies--celery, mushrooms and zucchini. I also put both green and red pepper. 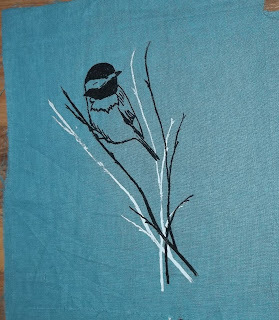 I did do some sewing today, my day wouldn't be complete without it, but I haven't yet taken a picture of one thing and the other I can't show as it is a gift. Also, this afternoon I attended a lovely 90th birthday party for a lady friend. She often comes to our Friday lunch with her daughter. She was a war bride and was quite excited to introduce me to several other of her war bride friends who were attending and told me where each one had come from. She sure is perky for 90! Friday is my errand and lunch with friends day, so I didn't get much accomplished. The first chore of the day was to pack up and mail a pair of boxing gloves to my daughter in South Korea. She has found a boxing club near her apartment. Also, I followed a sale flier ad and found a nice warm pair of boots on for half price. Considering I'm very difficult to fit and hate shopping, I'm pretty pleased. Once home later this afternoon, I put the finishing bits on the wonky house that I'm sending off for this block draw at the Love, Laugh, Quilt blog. It sounded fun and quick to do, although I have to admit I haven't done the free form style house before and it's not as easy as it looks. You'd think that since you don't have to measure or cut straight lines that it would be easy but not so. It was fun to do though. I'll be sending mine off later this week. 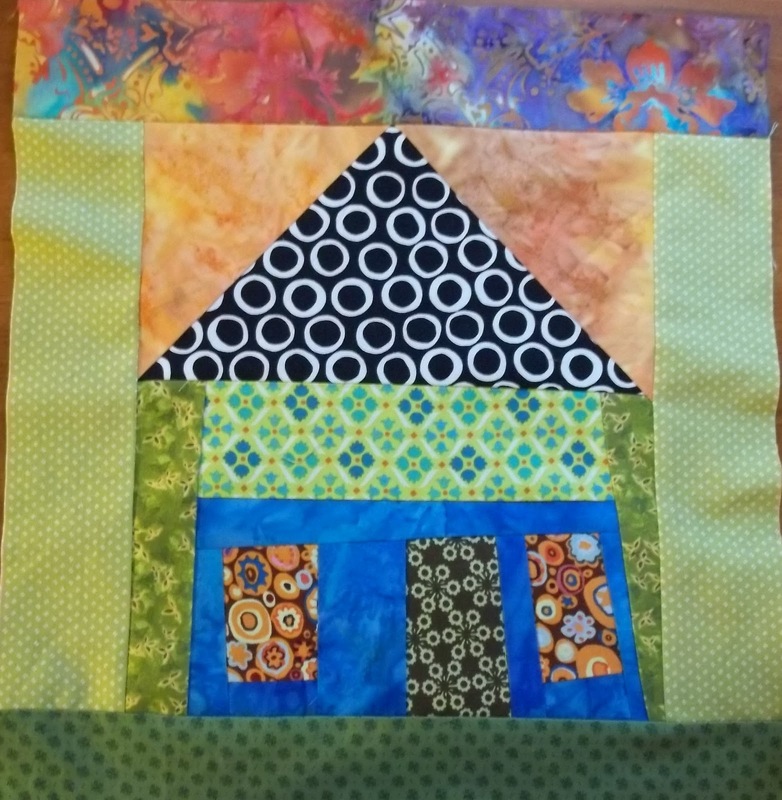 Here is the link to the blog where I got my wonky house idea. I went for my usual Wednesday morning swim at the pool today. It is a warm salt water pool with a sauna and a whirlpool where my friend Elise and I have been going for a while. For me it's almost as good as getting a massage, you feel so relaxed when you come out. 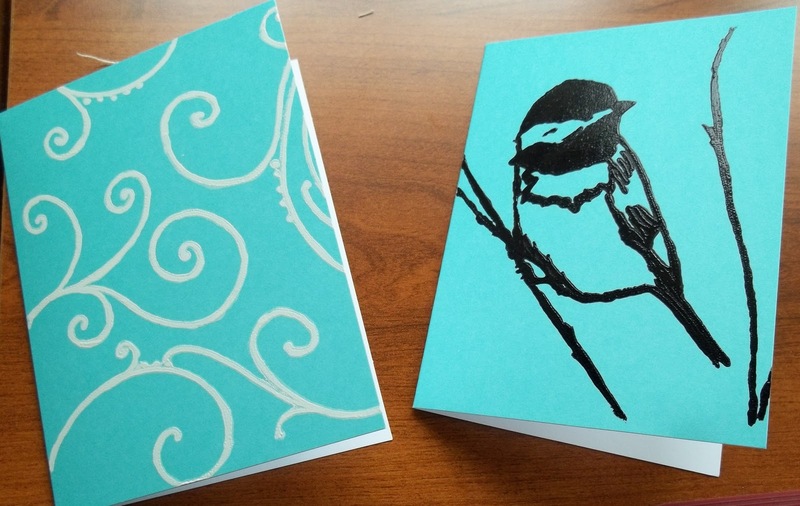 Before I went out, I screen printed these 2 pieces using Thermofax screens made here. They are both going to be used in Christmas gifts. I drew the flowers from a bouquet that was given to me, and I have no idea what they are. Then I was invited to my friend's for lunch and some sewing time. I neglected to take my camera, so again, I missed out on getting a picture of her quilt. 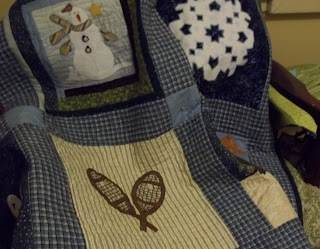 She is doing a 'quilt as you go' Christmas quilt. I really must try that some day. 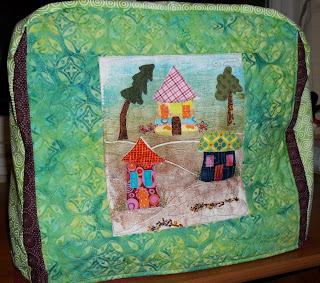 I took my Winter quilt which you will recognize if you have followed my blog, and I finished sewing on the binding. 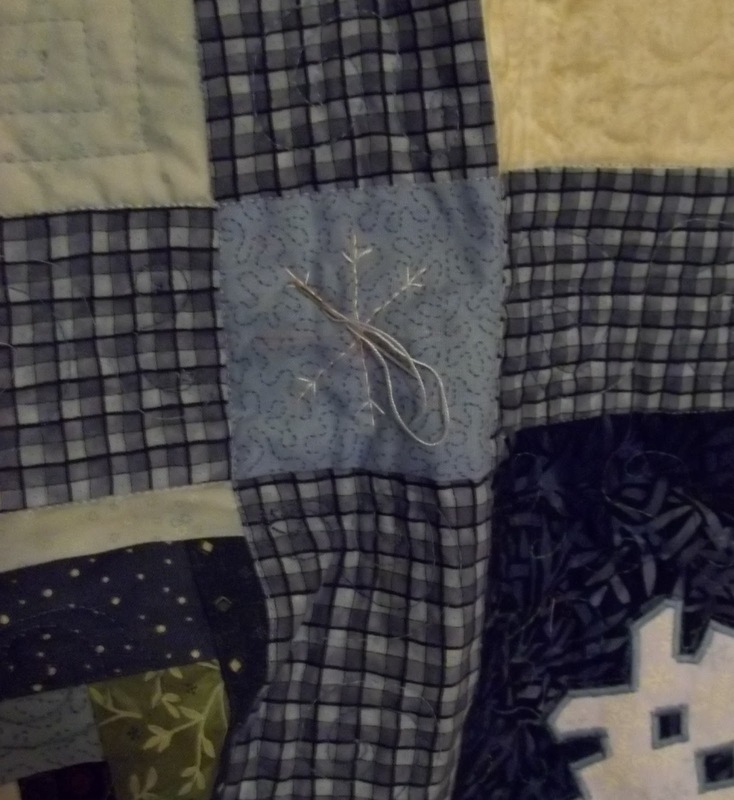 In each of the corner blocks I am embroidering snowflakes. These were timely as while I was nestled into the sofa beside the fire, I noticed the first flakes of snow falling outside. We are getting just a small part of the big snowstorm that the more southern areas of the Maritimes are getting. I am linking toWIP Wendesday. I had an early doctor's appointment this morning and came home just before noon. 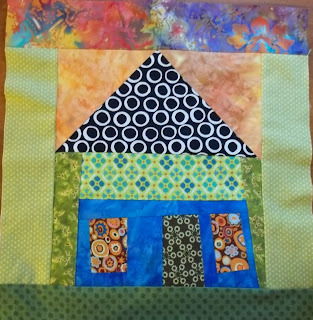 When my friend Elise called and wanted some help with the guild block of the month, I told her to come right after lunch. 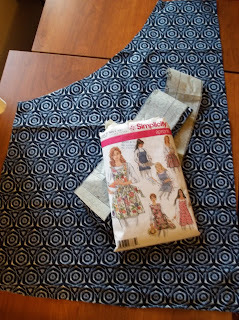 I helped her, while at the same time cutting some of my own fabric for the next (very easy) apron I plan to make. She inspired me to do the block of the month which I don't usually get around to. December's block is a snowman's head set into a star. I got busy and cut the pieces out for that too. Then at my snack time, I sat and checked for new blog posts and this one from Love, Laugh, Quilt got me going again. I've always wanted to do try wonky houses and the idea of trying one and sending it off into blog land was irresistible! I dragged out my basket of scraps and sat to play. 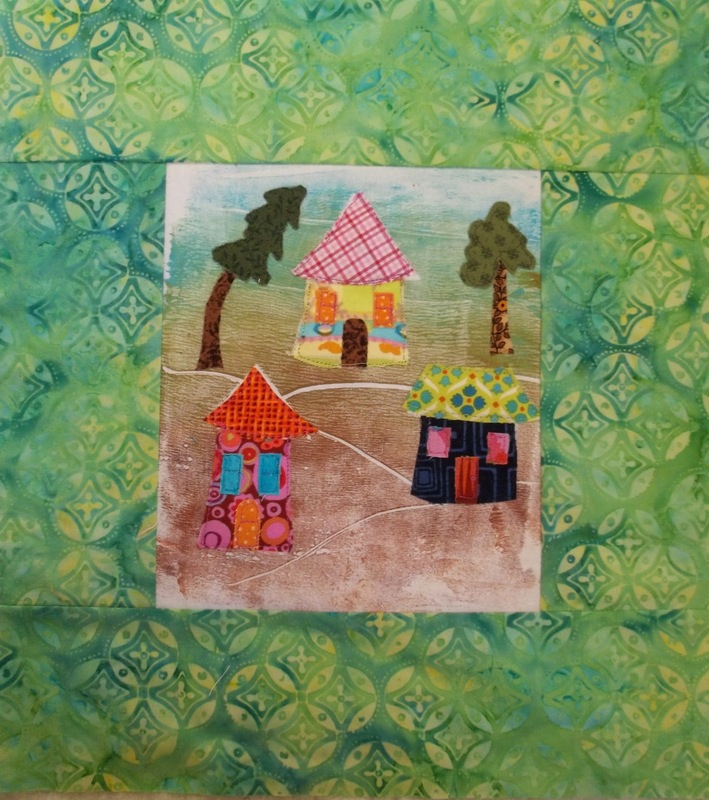 You can see that in my zest to add the roof, I neglected the background next to each side of the house. No problem, I'll just snip a quarter inch from the seam and add it on. As you may notice in my wonky house block, I was so anxious to get the roof on, that I forgot the sides which should have gone on first. Oh well, I only need to snip a quarter inch and I can add them on. Isn't it wild? I think I'll put a green for the background color and then perhaps a bright sky. This was fun. Maybe you'll join in? I went to my guild's UFO day yesterday, and I was on a mission. I was so intent to finish the dreaded apron that I didn't even take any pictures of some of the projects the others were working on. And it was a crowded room too with lots of things on the go. I know, it's mean of me to say that when I have nothing to show! 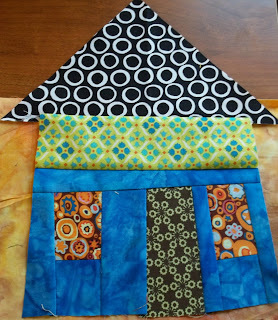 I did finish the apron which I want to put in the mail later this week to my mom. I would like her to have it for the December entertaining season. 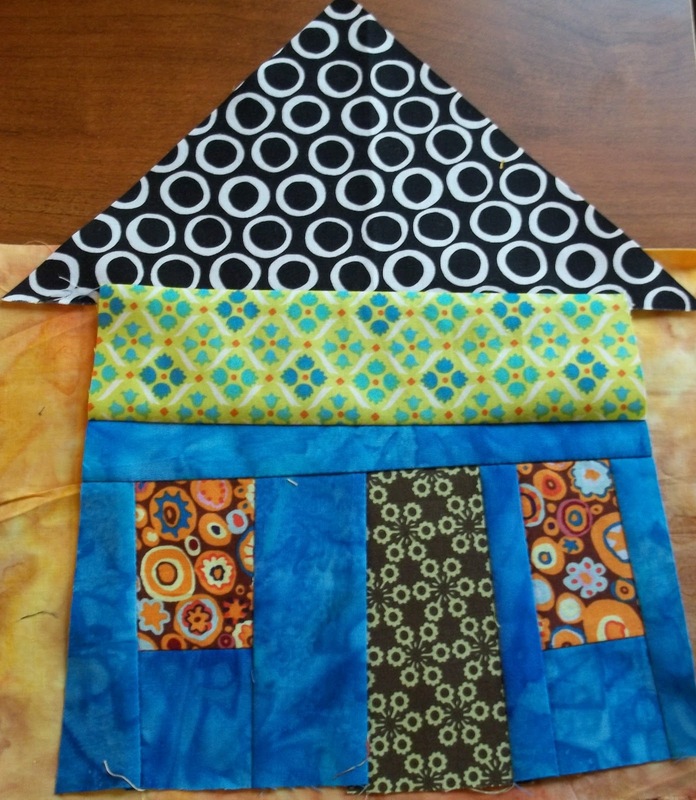 The second thing I finished up today is the serger cover that I made for a friend. 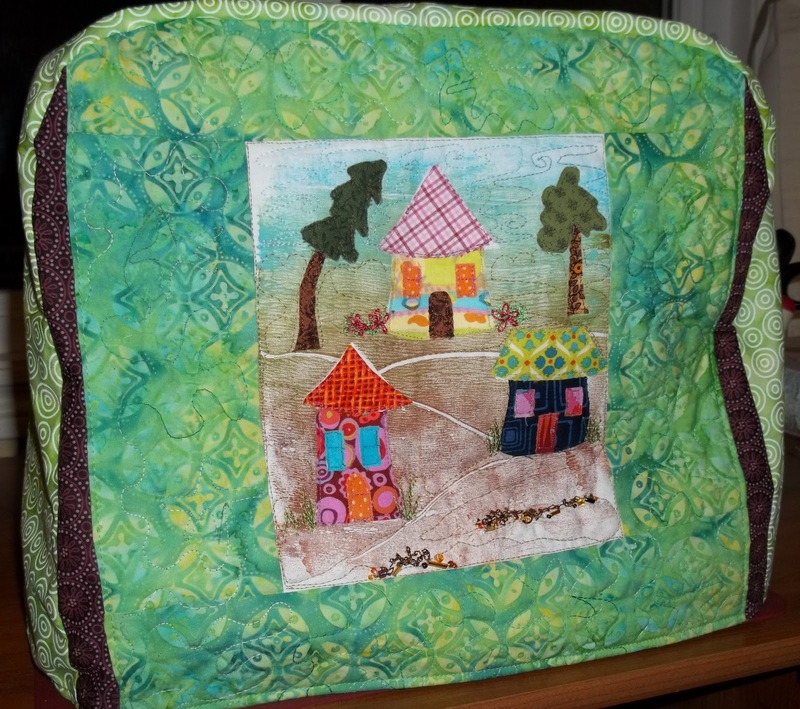 You've seen the quilted front (many times) while I worked on it. I managed after a rather woozy start this morning (some days are just like that for me) to get it put together. I had the lining made and the front and back pieces cut for the outside already. I tried and miss cut twice for the long piece that goes up and over the machine. 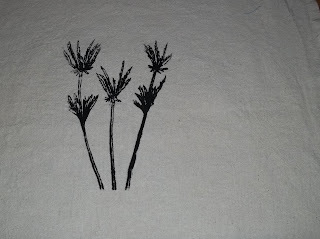 Although I ended up having to use a different fabric than intended, I'm pleased with it. This week I will move on to a couple more gifts in between a few appointments I can scarcely believe it is alomost the end of November!. 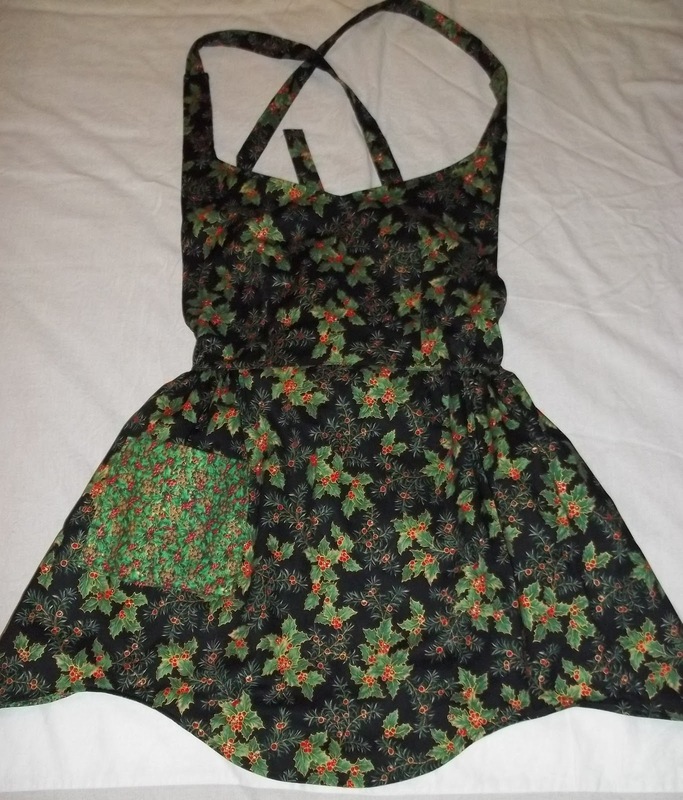 I haven't done much sewing this week other than my Christmas apron that caused me such trouble on Wednesday. It's been a week of recovery, errands and appointments. I did manage to get in a little knitting during my down time and I finished this shrug. My picture, I see now is a little blurred but there are no details to see at least. I think it is quite pretty and I hope my son's girlfriend will like it. My daughter, who is not always the most tactful girl, says they're out of style. It's really just an extra part to her gift. I so like to do handmade things. We'll see. Tomorrow is a guild UFO day and I plan to attend. 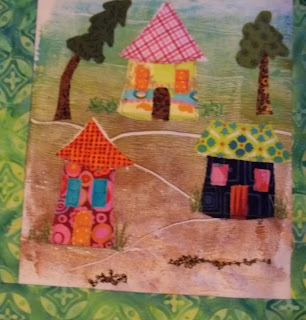 I'm taking 2 gifts that I'm working on, the dreaded apron and the little beach houses that I will put into a serger cover. 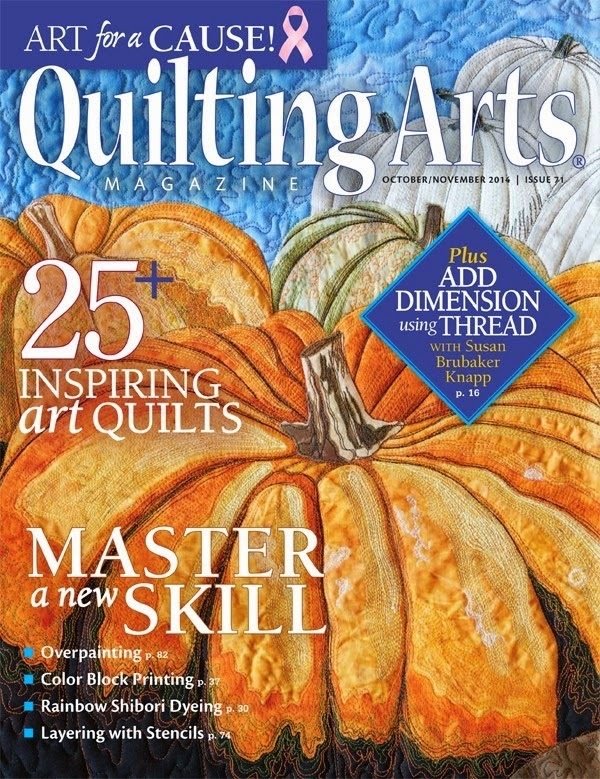 It should be a good day as it's always fun to spend time with fellow quilters and stitches. I wish everyone a lovely weekend. The weather here has turned cold. Three were snowflakes in the air today! The plan was to do a little sewing on a Christmas apron I decided to make as a gift. The pattern came from one of my books. I got the front and the lining cut out, sewed the darts as directed and that is when it started. 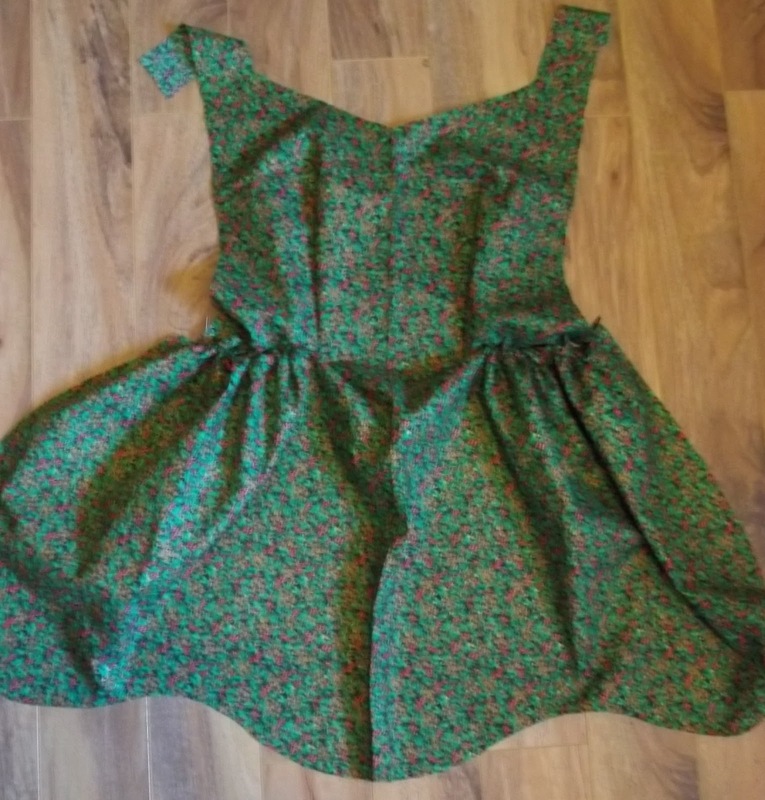 No matter what I tried I couldn't get the top to fit right with the bottom so I called a friend who actually sews aprons to sell for some help. Well, she couldn't figure it out either, but she at least confirmed that my idea to fix it would be OK. I then worked on my little beach huts, putting on a little beading and some embroidery. I believe I will call it done and you won't see it again now until I get sewn into the serger cover it is meant for. One good thing. I made a stop at the grocery store and was hoping to get home in time for a walk--all my fussing with the apron ate up my day. On my way home I got pulled over and I couldn't even imagine what for. It was my registration; it expired the end of October. Just the other day on the news they said that the government has decided to re-start sending out the reminder notices for registrations, as too many people were forgetting to re-new. I thought great, that will be good and I still didn't think to check. You see here in Nb, until a couple of years ago, we received the new registration form in the mail and one would always know it needed to be done. Then, the government decided as a cost saving measure to stop sending them out. I'm sure the police welcome it. They must be making money! So, I got fined $172, and I was late getting home for my 3PM pill and my snack. Since I'm diabetic, I was shaking and getting a head ache. I've had my snack while I'm sitting here. I'm too weak to walk and I've missed the sun anyway. I'll have supper and go out later in the dark. It will still be good to get out. Forgive me if I sound whiny; I know it could be worse. I'm going to put it behind me, well except for the fine which I have 6 months to pay, thank goodness. I am still feeling the effects of being ill last week. The laryngitis and the sinus infection are almost gone but because of my other underlying health issues, I collapse part way through the day. I have lots of knitting for Christmas on the go anyway. This is a little bolero that I finished. 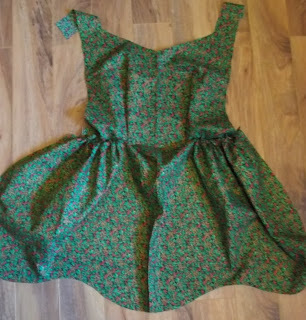 I need to sew it together and put the last ruffle edge on it. Yesterday, it was so nice that we walked at another golf course in town. It was beautiful. I will be doing less quilting and more sewing and knitting for Christmas for the next while. I found this free pattern for an apron and I think I may do a couple for gifts. The first thing I will do is draw up a paper pattern to make it easier. For now though, I must go rest. 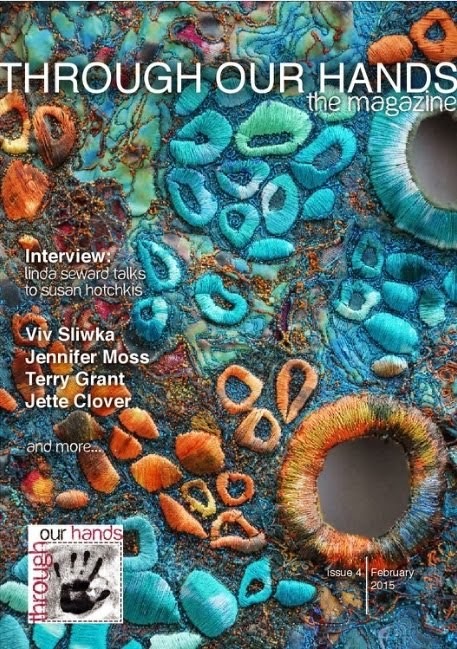 Don't forget to leave a comment if you'd like a magazine mentioned in my last post. 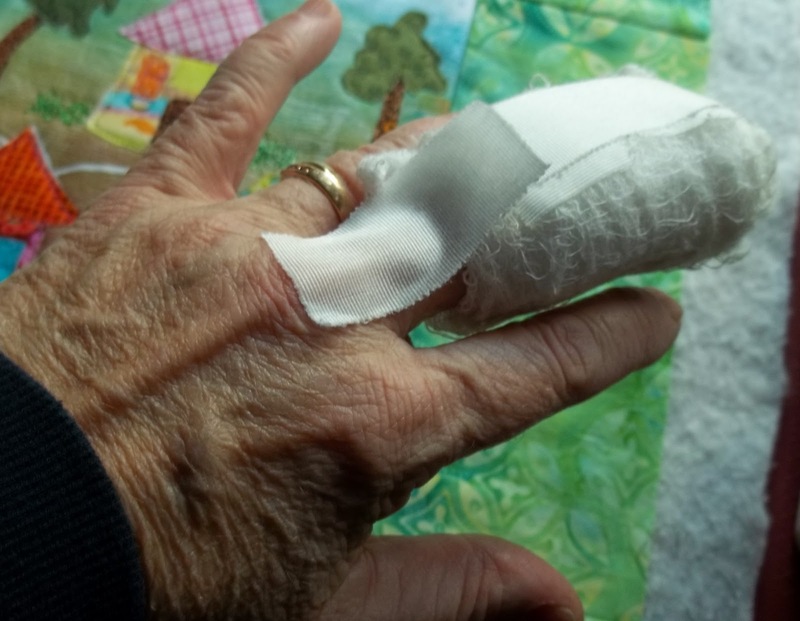 Just look at the huge dressing that they put on my finger! I'm anxious to take it off but when I thought about it, I realized that the stitches are on top of the joint, so it's being protected with the dressing. I can sew, though I've been being lazy since I'm on antibiotics for the sinus. It's tricky to type. And boy my hand looks old! I was anxious to sew today though. I finished up the machine quilting around the houses and started the quilting in the border. 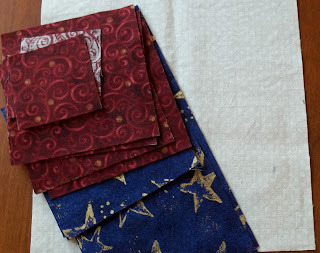 I looked through some designs first, tried some samples, then started the machine quilting. Then I didn't like it and ripped it out. I tried some more designs on scraps and went back to the borders. I'm semi OK with it but not really happy so I stopped. It doesn't show very well that I'm doing starfish with meandering in between. I am still cleaning out magazines. 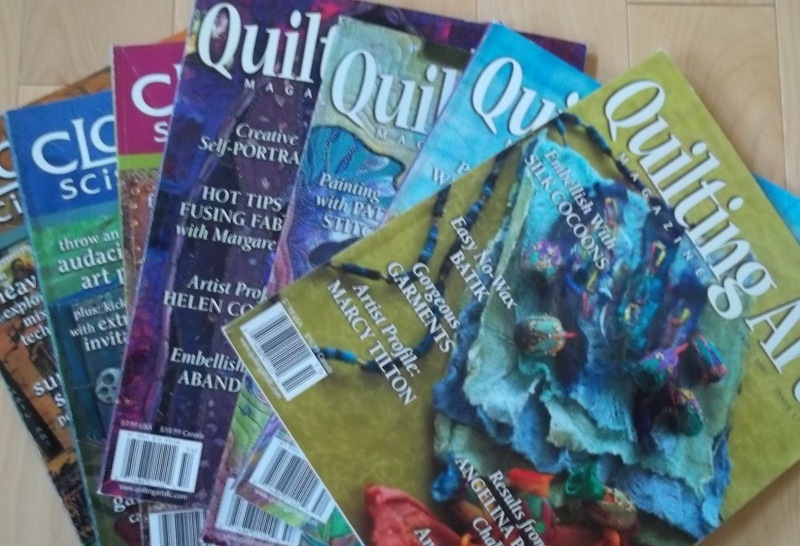 I have 4 Quilting Arts, issues 17,18, 19, and 20, and 3 Cloth Paper Scissors, issues 2, 3, and 4 that I'm willing to part with. If you want one, leave me a comment and after a week or so I'll send some out. I might like to put 2 in a pack and if more than one person wants then, I'll draw names. My Friday lunch girls switched to today since everything is closed on Remembrance Day. While out, I had to pick up a few groceries and a prescription. Between that and still not feeling back to par, I only did a bit of sewing. I originally had the idea to make needle lace for the seaweed and stitch it on, but then I thought why not just thread paint right on the scene. 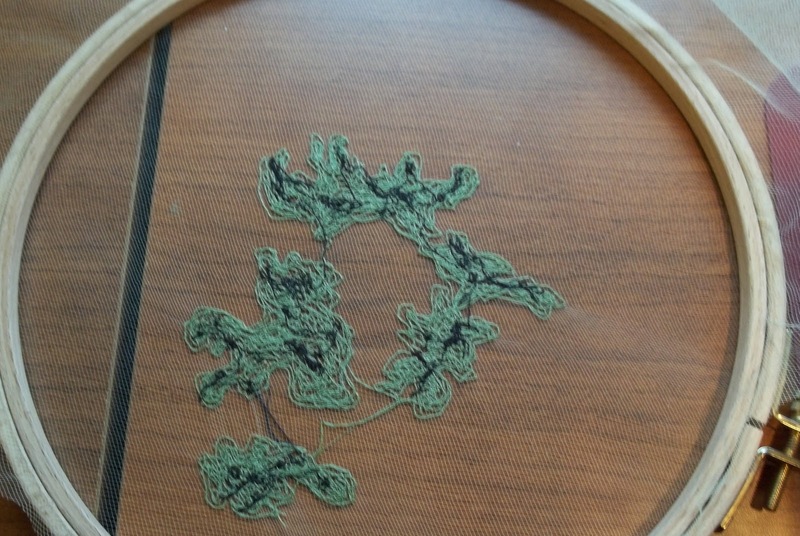 For the bit of seaweed in the foreground, I used two threads in the needle, so it would add 2 colors at once and fill in faster. I thought that since I had batting on the back that I wouldn't need the hoop. As you may notice it did pucker some, but I think it will be fine once I iron it and add some bead work. 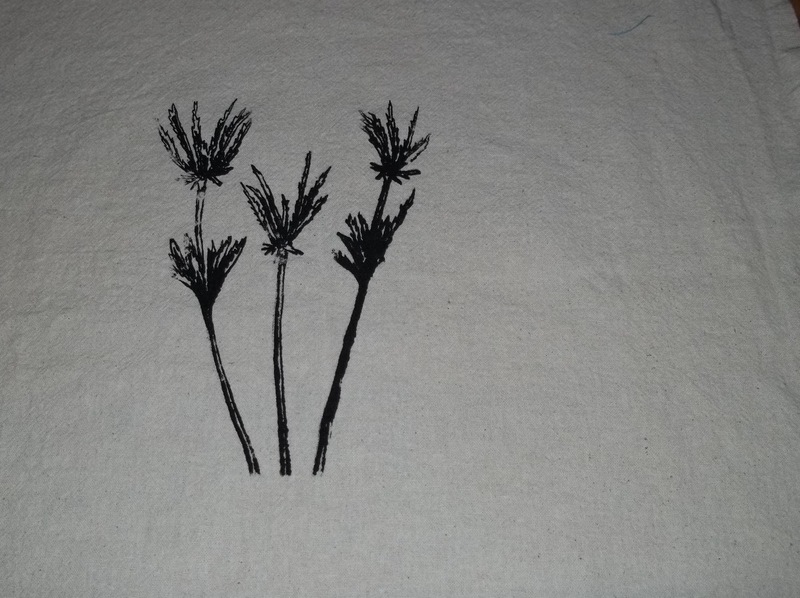 I'm not going to go overboard on the embellishing because this is going to be incorporated into a sewing machine cover. 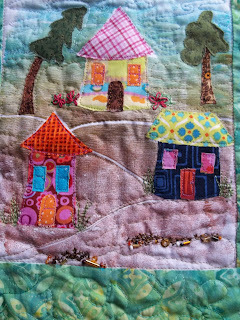 The embellishing is my favorite part though so I will probably still add quite a bit, maybe a starfish and maybe some pink roses into those bushes by the rear cottage. I'm linking up to the Needle and Thread Network for WIP Wednesday. I've had a nagging laryngitis for about a week which I attributed to the heaters now being on regularly in the house. I always have a bit of an adjustment to that. However, I awoke yesterday morning with another headache, my voice was worse, and I knew form experience that I had a sinus infection. I started to feel quite ill by mid morning, so I knew I had to increase my dose of cortef and rest up. Today, I got a prescription for an antibiotic at the clinic. I've been sinus rinsing with the Neti pot twice a day which is very effective in cleaning out any infection. I was so bored yesterday. I really only felt like lying around. I finished a book and then tried to knit. Has anyone else checked out daytime TV lately? It's pretty bad. 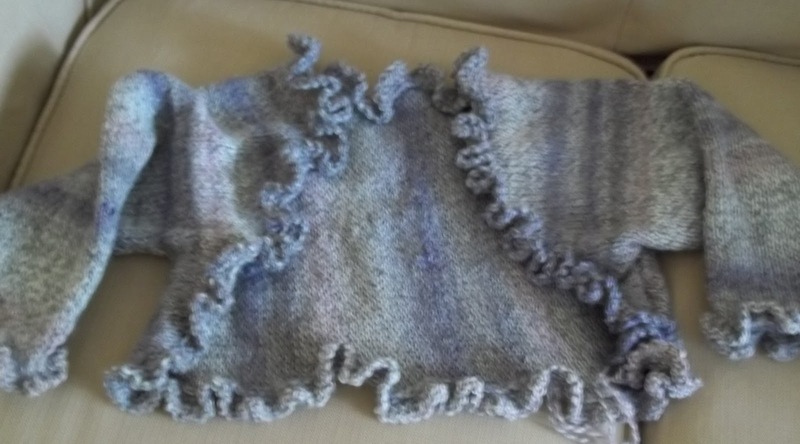 I have nothing I can show for my day yesterday as my knitting projects are for Christmas presents. 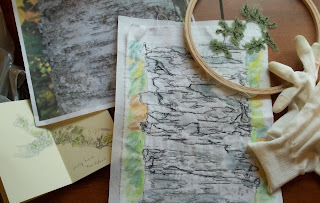 This afternoon, I re-visited a piece I started earlier in the fall.. 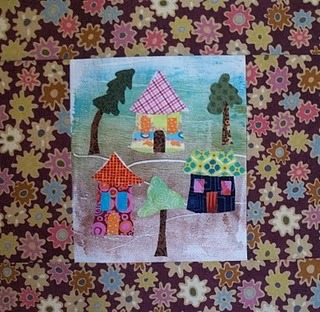 I had decided to take off 1 tree and change the border. I did that; I'm happy with it now. I started the tedious process of stitching down all the fused parts. I was about halfway or so through that process when I thought of doing all the outlining in black which makes it resemble an ink sketch. It was too late though. I suppose I could have gone over what I had done but there was only a little bit left. 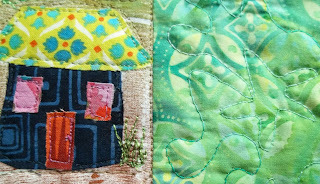 The next step will be to add the free motion quilting lines on the beach around the houses, quilt the border and do a little embellishing at the front, perhaps a few beads and stitching to represent some seaweed, shells and such..
Gord and I never venture away from the house much for our meals. We are vegetarian and it's not easy to find restaurants to eat here. We had heard about this one in a small village called Petit Rocher just about a half hour north of here, so we set out around 4:30 yesterday for a drive.Once there,we drove out to the wharf for a picture. I love the rock formations. 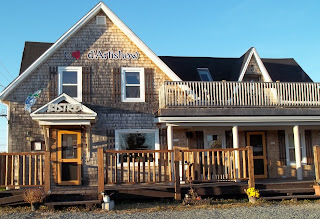 The name of the restaurant, Coeur D'aAishow, is a play on words. in French artichoke is l'artichaud. It is actually a bistro that has entertainment on Thursday, Friday and Saturday night, the only times it is open. 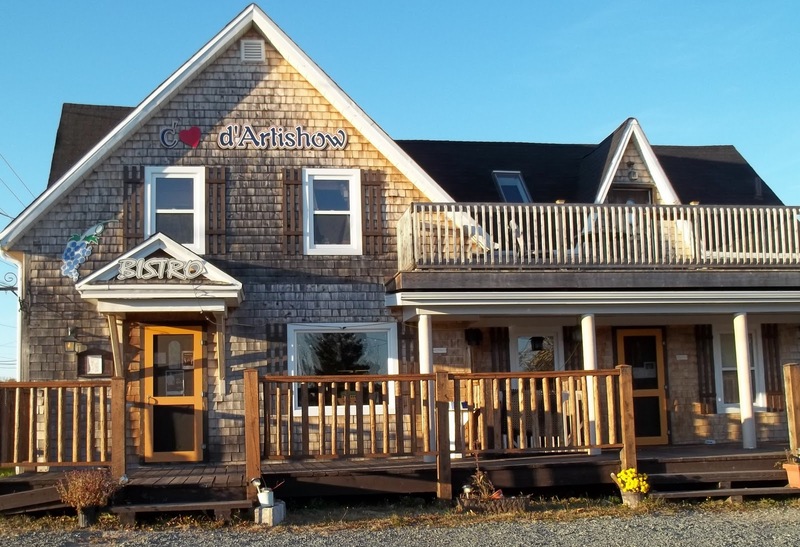 It is a quaint little arty place where they have 1 or 2 things on the menu each night and it is all made from scratch. 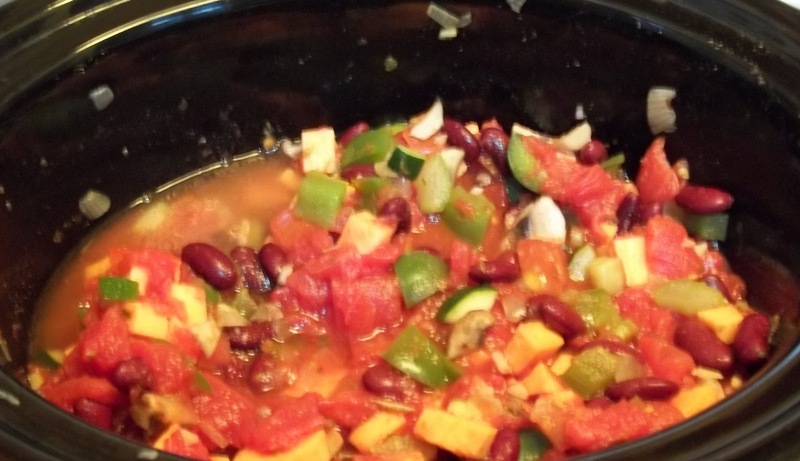 The waiter said they even cook their own kidney beans for the vegetarian chili. We were there at 5PM and so ordered and ate before the place filled up at 6:30 for the night. After we placed our order for tomato basil soup and a veggie pita pizza, the waiter actually sang in the middle of the restaurant. It was a beautiful song by Barry Manilow taken from a new CD of his called Paradise Cafe. We laughed about it after; we where the only English people there.The meal was wonderful though, and we left in time for the French speaking customers to fill it up for the night's entertainment. This picture we took in Beresford when we stopped at my in laws on the way home. Today, we decided to go golfing . We actually wore our winter undershirts and a wind jacket and were very comfortable. There was no one else around. We were able to take our time. 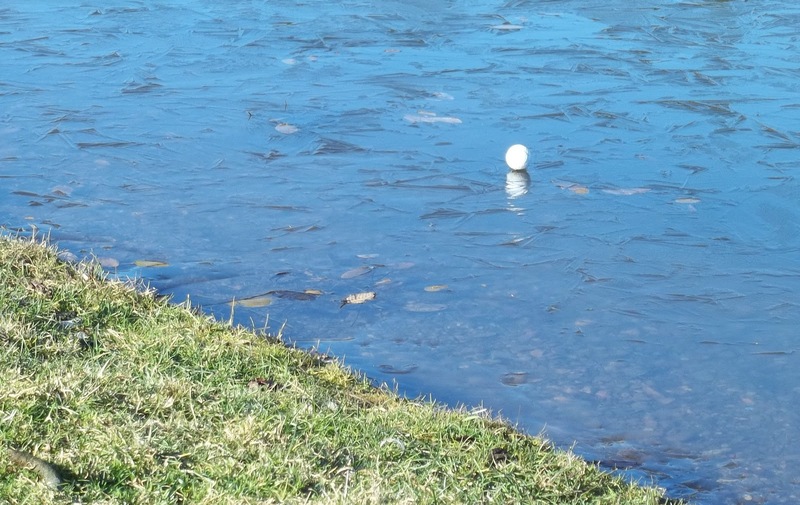 Another advantage for this time of year is that when you hit it in the water you don't always lose your ball. We laughed when it hit the pond and stayed up on the thin ice! 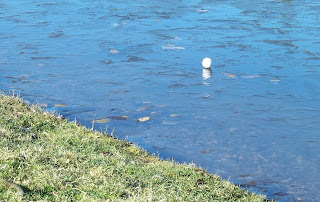 It looked like it was a magical floating golf ball! While I intended to paint again today, I'm heading off for a soak right now and will likely collapse after supper. I'm so glad to have leftover spicy coconut soup for supper! It's a lovely sunny but cold day out there today. I think what makes it seem so cold is the way that our temperatures have been fluctuating. One goes out in a thin jacket one day and is totally unprepared the next day for the cold. Oh well, it is only about 6 weeks until the first day of winter. Dare I say that word? This morning I saw the plastic surgeon and I'm booked this Thursday to have a synovial (caused by osteoarthritis) cyst removed. It shouldn't take long and will require a few stitches. Luckily it is on my left hand. 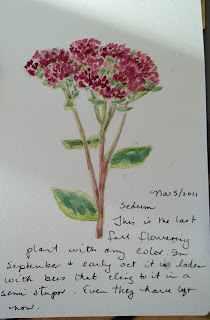 After lunch, I did this little paint sketch of a small stalk of sedum, Autumn Joy, from my front walkway. 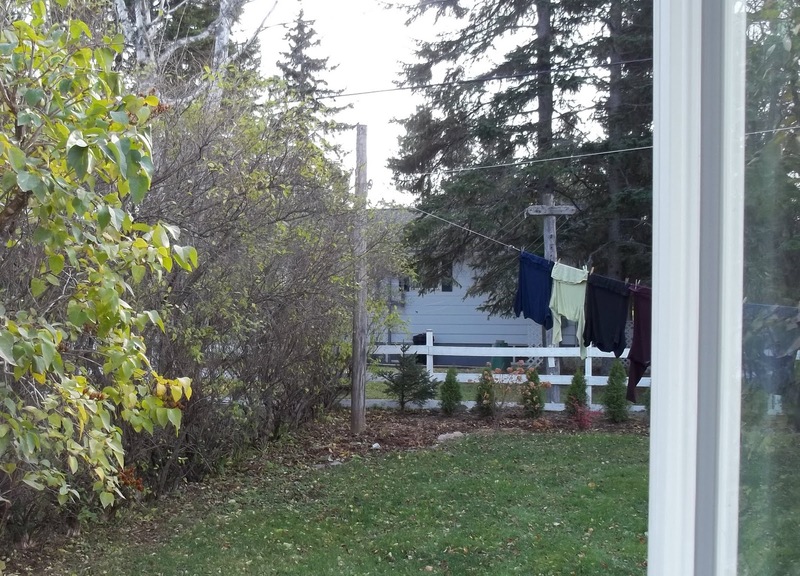 It is the only real bit of color left in the yard right now. While I really enjoyed all the colorful exuberance of summer's flowers, I must admit that I love the soft colors that come in November, all the soft greys, blues, beiges and the pastel, heathery pinks that you see in the sky and sometimes in the trees once the leaves are gone. 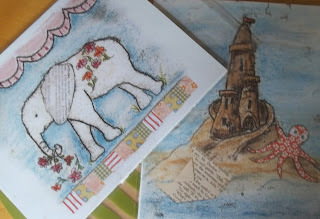 Today, I picked up 2 of my original mixed media pieces that I had matted. I also received some cellophane bags that I ordered, so that I can package up the prints that I had done. I had them done at a professional printer and they are 8 1/2 by 11 inches. 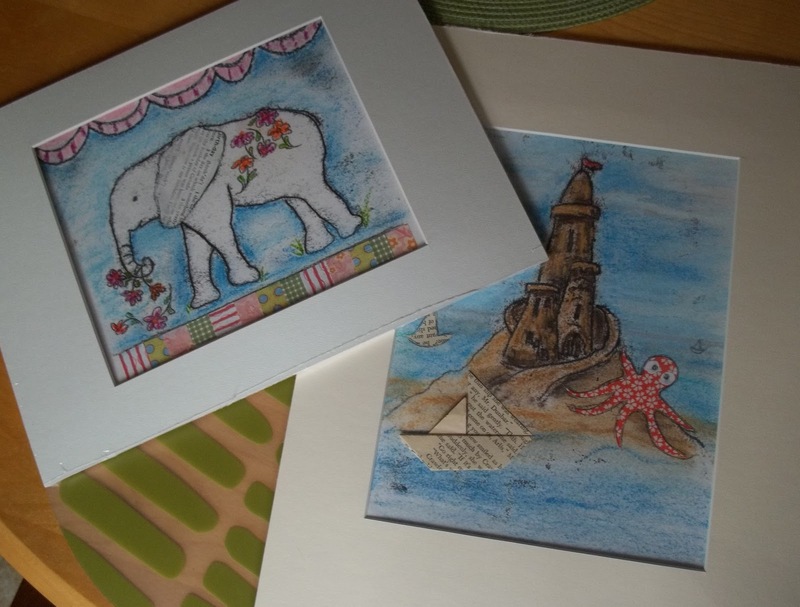 For now I will put them in the local shop but I'm aspiring to start an Etsy shop sometime after Christmas for my prints, my cards and my fiber art quilts. If anyone is interested in the prints you can certainly email me. 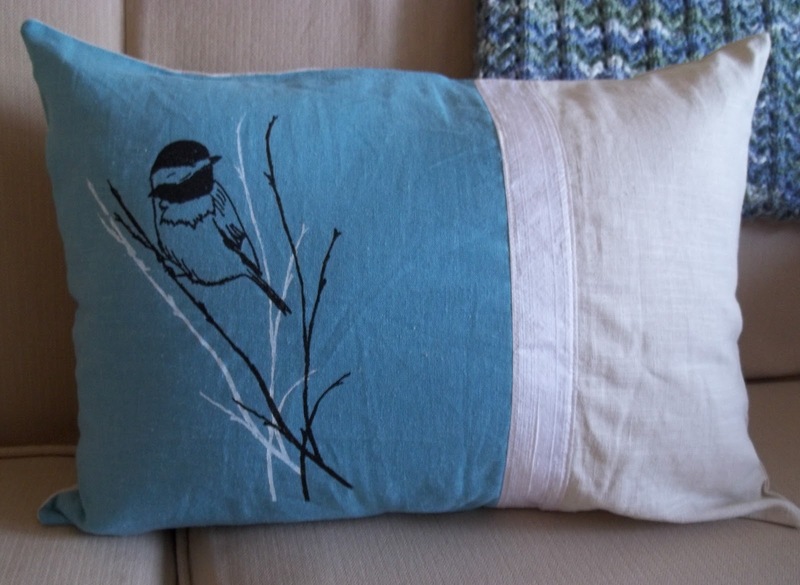 Besides getting groceries this morning and then making a spicy coconut soup for supper, I put this cushion together this afternoon. There is enough slack, I think, to allow me to go back on top with a thin line of top stitching around the outside edge. Now that it is done (a friend has requested it), I can get going on some Christmas gifts. It's another lovely sunny day out there even though it's a bit nippy and there was frost on the car windshield when I went out at 10AM. I went for my usual Wednesday swim, came home for lunch and then sat down here at the computer with my cup of tea. Shortly, I have to go back out to get my flu shot. I'll not be getting much else done today. 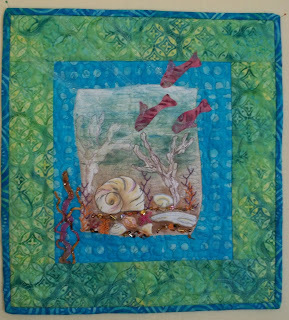 Just so that I can link up with the Needle and Thread Network for WIP Wednesday, I am including my final picture of my seashell wall hanging. It is completely finished. I promise, I won't be showing it again. On Friday, I will take it to our local craft shop. I've been a little quiet here for a few days. 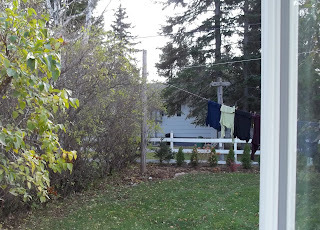 Except for one seriously stormy day on Sunday, it has been nice, so I've been doing a little outdoor work in the yard. On Sunday night as promised, I did the draw for the magazines and they are going to this blogger. On the weekend, I did some garden clean up in 2 of my small gardens up near the house. 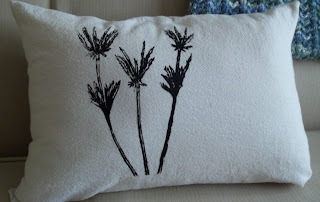 Today, I went out again to clean up the hostas and pull out some weeds in the garden at the back corner that I can see from my sewing room window. Another day, I will tackle the ones at the front of the house. Really, I should have done them first but I look out my windows at the back gardens from both my kitchen and my sewing room. 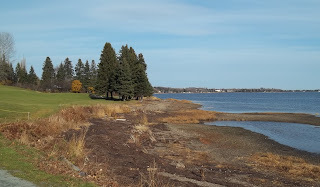 On the weekend, I also went to a quilt show in a little place on the Acadian Peninsula called Inkerman. I'm sure the population is only several hundred, but they sure did a wonderful job at all of the displays. When we arrived, the parking lot was full. People had come from all around. I was reminded twice by my friend to bring my camera and still I didn't get any pictures! If you'd like to see great pictures, go here to my friend Wendy's blog for a wonderful narrative of the show. 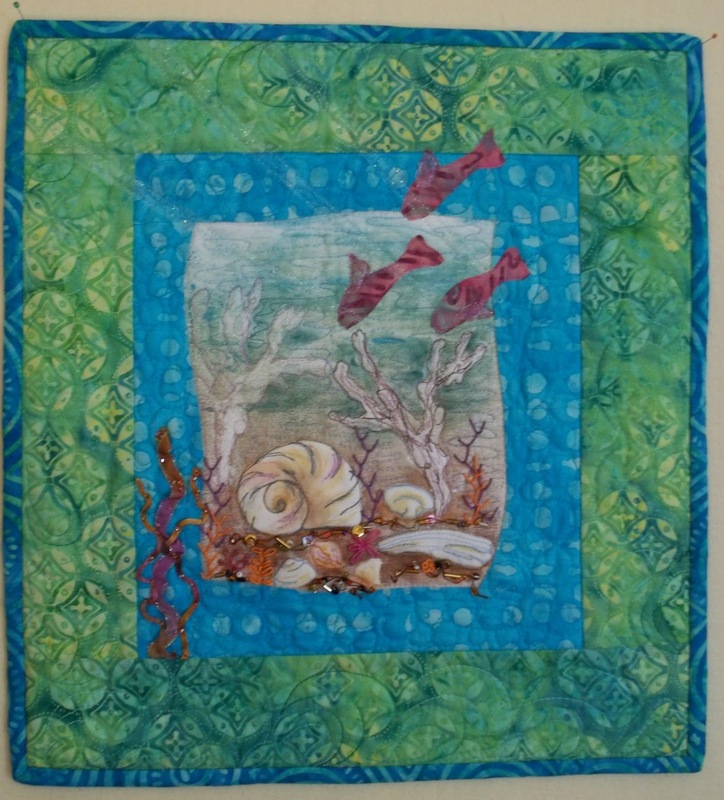 Now, I'm going to make a cup of tea and sit down to hand sew the binding onto my seashell piece.